Complete play area re design at St. Laurence's, Coventry. Are you looking for school playground equipment in Hertfordshire? Ranging from imagination and mucky-play provisions to small and large adventure-play climbing frames, you’re sure to find what you need to transform your school playground in Hertfordshire, here at Setter Play. Setter Play originated in Hertfordshire, in Pirton, near Hitchin, more than 22 years ago. Ever since, we have worked with schools, nurseries, councils and the private sector, across our home county, and are focused on creating an enjoyable environment for children to learn and play. We manufacture playground equipment in Hertfordshire to suit the requirements of all schools in the local area, so whether you’re looking for equipment that suits primary schools or Early Years Foundation Stage, rest assured – you’re in capable hands with Setter Play. Our playground equipment in Hertfordshire improves child development. It develops the physical, emotional and cognitive strength of young children and enables them to set themselves realistic challenges. As well as this, it provides them with the opportunity to express themselves, whilst mixing with their peers and making new friends. Our school playground equipment in Hertfordshire, be it climbing frames, benches or canopies, is guaranteed to promote inclusive play, encouraging everyone to get involved (staff included!) Playground equipment is a simple addition but can effectively bring your playground to life. Can you afford to miss out? A favourite of many primary schools in the Hertfordshire area is the Thermoplastic Roadway Features. It’s a great way to draw on the imagination of children and develop important skills such as communication. Here at Setter Play, we provide a wide range of climbing frames that are manufactured to match your design requirements, suitable for the environment and safe to use. We take care of the design, manufacture and installation, so you needn’t worry about climbing frames in Hertfordshire being installed correctly. If you’re looking to incorporate the curriculum into the design of your playground, Setter Play can help you. Although we specialise in exciting climbing frames, we also create units which can enhance the learning of students and provide benches which are perfect for outdoor lessons. 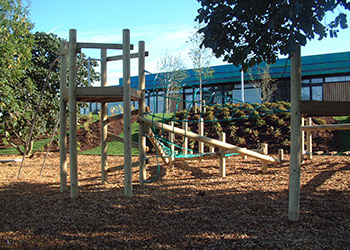 At Setter Play, we design a wide range of climbing frames for schools in Hertfordshire. We provide products for all difficulty levels and some of our units include a slide, ladder, rock climbing wall, monkey bars, fireman’s pole and scramble net. They are all carefully manufactured to ensure safety and are guaranteed to make a statement when installed. The climbing frames in Hertfordshire are designed to accommodate the needs of all primary school children and can often be the focal point of your playground. We make sure that they are finished in bright colours and match the surroundings perfectly. If you have a design in mind for your playground or would like to discuss your requirements in further detail with our team of experts, don’t hesitate to call us on 01462 817 538. We will be more than happy to guide and advise you in making the best choice for your school. At Setter play we pride ourselves on offering safe, high quality play equipment at fantastic prices. We're dedicated to providing the best possible value and the highest levels of service. We're always happy to help with any questions or queries that you may have. Contact our friendly team now. Subscribe to our newsletter to stay updated with our services and up-to-date news from us. Copyright © 2019 • Setter Play • All Rights Reserved.